And I mostly just slept. Doesn’t have quite the same ring to it as the infamous song by Murray Head, but it is true. I was pretty tired, having only slept a few hours the night prior in Doha and only a few hours the night prior to that on the plane to Doha. Even with most of my time spent sleeping, however, that didn’t stop me from getting out to see a bit of the city and enjoying the parts which I know I like. The train in from the airport is incredibly easy and I managed to skip the traffic which was a nice win. Soon enough I was settling in to my room at the FuramaXclusive Sathorn. For a clean, conveniently located (1.5 blocks from a BTS station) hotel and only $55 for the night (~15% of which I get back through hotels.com WelcomeRewards and my cash-back booking portal) I have no complaints at all. It is actually the second time I’ve stayed at the property and I’d go back again at that price point. The location is not perfect – there isn’t a lot around the neighborhood open at night for dinner or such, but I like the hotel well enough and the price is quite fair. Speaking of dinner, I walked around for a half hour or so, taking some pictures and trying to stay awake long enough that I’d be able to sleep through the night and sortof be on local time in the morning. I was also looking for somewhere to eat dinner. For no particular reason I was trying to find a restaurant rather than a table and stool on the street. I honestly don’t know what I was thinking. 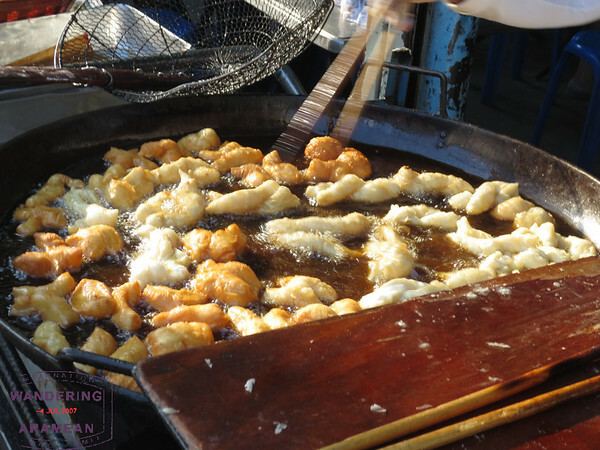 The street food in Bangkok is fantastic and I’ve always enjoyed eating it. Before too long I was settling in at the stall around the corner from the hotel and adjacent to the BTS station, tucking in to a plate of meat & rice with a beer to wash it all down. Not too shabby for ~$4.50. The week I was in town was roughly the hottest of the year, and the humidity did its best to match the heat. It was, quite frankly, disgusting. Despite my best efforts to sleep in I was up early and that was actually almost a good thing as it meant I could get out and see a bit of the city before the sun was high overhead, turning the streets into a steam bath and turning me into an incredibly unhappy, sweaty, sticky mess. 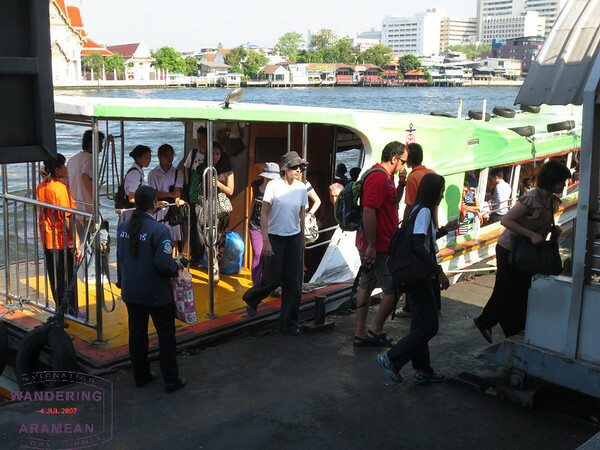 After grabbing fried dough of some sort for breakfast, I hopped on the BTS and alighted at the Saphan Taksin station, adjacent to the Central Pier, so that I could take a ride on the Chao Phraya ferries. 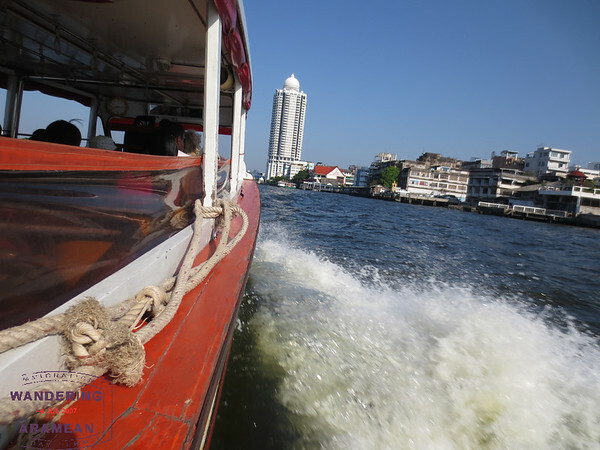 From my first visit to Bangkok I have loved the local ferry rides. There is an express version of the boats for tourists (I think maybe they speak more English on board, too) but those aren’t nearly as much fun. Packing on to the ferry with monks, school kids and locals commuting to work is a way better experience to me. Plus, the reasonably slow ride up the river offers plenty of time to see city life from that vantage point. It is a great way to get a feel for the vibe of Bangkok. On this particular trip I think the part I was most proud of is that I actually managed to figure out which boat I wanted to be on and get on the correct one the first time. That hasn’t happened on previous visits. I was on the ferry for about 45 minutes, getting off at N9 (Tha Chang) which is the stop just south of the Grand Palace. The Grand Palace stop is chaotic and crowded, with hawkers selling food, hats, tchotchkes and everything else. 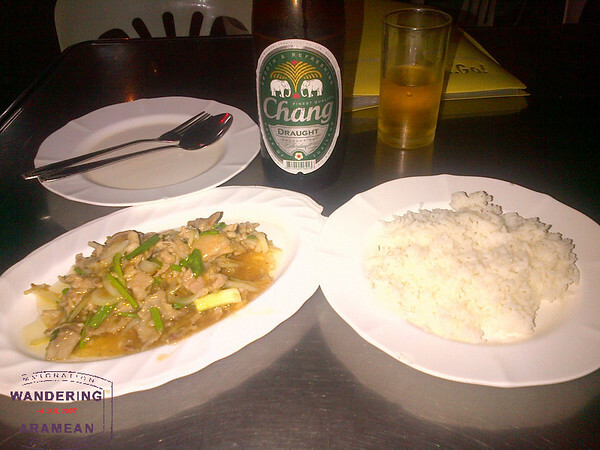 The Tha Chang stop is just a bit calmer, but easy enough to get out of without quite such crazy crowds. Of course, I then proceeded to walk up into the din of the Grand Palace crowds to get breakfast from one of the hawkers there, so it isn’t like I avoided the scene completely, but I did enjoy the walk and the few minutes of not being completely in the center of the crazy. After breakfast it was back on the ferry, this time headed southbound, and back to the Central Pier station. I basically retraced my route back to the hotel and was in my room, showered and refreshed, about 2.5 hours after I headed out that morning. Just enough time to experience the bit of Bangkok I truly enjoy and also to clean up before heading back to the airport. Three flights to catch that day and I wanted to be there a little early because I was going to be transiting Yangon, Myanmar on two separate tickets and without a visa. I figured I’d need the extra time at the ticket counter. Plus, the massage in the Thai lounge is a nice little perk, too. Bangkok isn’t really a city I love in Asia. There is good, cheap food to be had and I know my way around well enough but the general vibe of the city isn’t one I love. I’ve had some great visits there – one was for a wedding and we had a fantastic time – but overall I find the city basically a decent place to overnight on your way to wherever you’re actually going, not an actual destination. Fortunately that was the case for me this trip as well (though I’m still not sure where I was actually going). Read more from the trip here. Ahh, thanks. I always love these hurried, frenetic, sleepless trip reports to help me appreciate even more my peaceful, relaxed, comfortable weekends at home, sweet, home. No airports or crowds or strange beds or soaked in sweat…etc. Not exactly sure what the point is of these types of rushed trips other than just to say you’ve done it, but for whatever reason, you miles bloggers sure seem to try and top one another with ’em. Pretty entertaining. Glad to have someone come out and say that Bangkok is overrated. There is so much hype and to be sure it is an interesting place, but some bloggers make some of these cities in Asia to be more than they really are. You are a couple of weeks ahead of me. I have 2 overnight flights with a 12 hr layover in Bangkok. 1/2 minded to head into the city, 1/2 minded to try and get some work down and camp down in Thai’s first class lounge. Perhaps a quick trip for lunch in the city and a wander around the streets? (Thanks for the tip of the cheap hotel – filed away for next time). I’d say 12 hours in the lounge is too much, Levy Flight. I’ve yet to find any lounge where I think that’s a good idea. And, yes, I’ve been in the LH FCT, VS Clubhouse, TK IST lounge and many of the other “great” lounges around the world. A meal, shower and massage takes about 3 hours IME. That leaves you another 6 hours of time at least to do something. As for it being absolutely crazy, johnny, of course it is. When originally booked i thought I’d have a bit more time on this trip. Turns out I didn’t. So I made the best of it in a manner which works for me. Sure, 10-12 hours at a time in any given city isn’t much, but it is often enough to do one or two things and get a feel for the flavor of that city. Compared to sitting on my couch at home, I think it can be a fun little sort of adventure. I also happen to like flying in airplanes so there’s that, too. @Santastico: I think the distinction is in finding things you enjoy doing there, not that a city is inherently good or bad. If you and I happen to like different things then it only makes sense that we’d enjoy various destinations to different levels. I’m not suggesting that everyone should skip Bangkok. There are even little bits of it that I enjoy in small doses. But, more than not, I see it as a means to an end, not a destination in its own right. Love Bangkok. My favorite city in SE Asia. It is not overrated if you know where to go and how to enjoy this amazing city. I just returned from Bangkok two weeks ago and I completely agree with the other comment about it not being overrated if you know where to go and how to enjoy the city. One of the highlights of my trip was the rooftop bar at the State Building (Lubua hotel) on the 63rd floor. It’s the highest rootop bar in the world and was featured in the movie Hangover part II. I live in NYC and have never experienced anything like it. The city is big, chaotic, spread out and very dirty in some places. However there are very interesting places to go — and between our concierge at the hotel along with internet research we were fairly well prepared. I wouldn’t touch the street food as there were people in our hotel elevator that got sick from it. With a little help, we found several great restaurants at a reasonable price. Even the high end hotels are reasonably priced, so I give it a big thumbs up. As for skipping street food completely, that’s a mistake IMO. 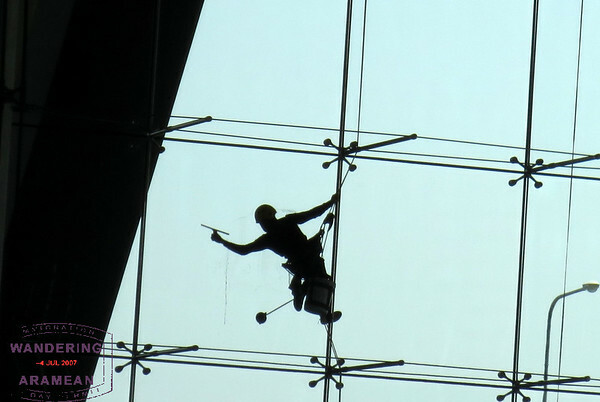 That’s not to say you should go out of your way to buy from everyone you see and just hope for the best, but there are a few relatively simple tips which make it as safe as dining in a restaurant, particularly when it isn’t clear that there are particularly strict standards by which the restaurants are graded. Fresh cooked, not pre-made and reheated is a good sign. So are disposable plates or separate cleaning stations for them. I’ve done the “fancy” version of Bangkok. My wife and I spent part of our honeymoon there and had a good time, getting clothes made, staying in The Oriental (one of the early blog posts here was actually about that stay and written by my wife). It was fine, I suppose, and the luxury comes relatively cheap in Bangkok. But that’s not enough to have me in love with the city. I’ve been to a number of the markets all over town, done tours back through the canals, eaten far more than my share of food and even attended a wedding of two great friends there. All good experiences in their own right, but it barely makes the top 10 cities in SE Asia for me. The good news is that means I won’t be battling y’all for the nicer hotel rooms or upgrades. Agreed totally with Santastico, just spent some time here and also visiting the in-laws in the provinces for Songkran before attending the DC FTU. I love Bangkok and find it to be one of the most interesting cities in Asia! Theblakefish, don’t lie, you just like the ladyboys in BKK. the food in the first pic looks great! I regret seeing your blog so late at night with no food around. 🙂 love durians!!! 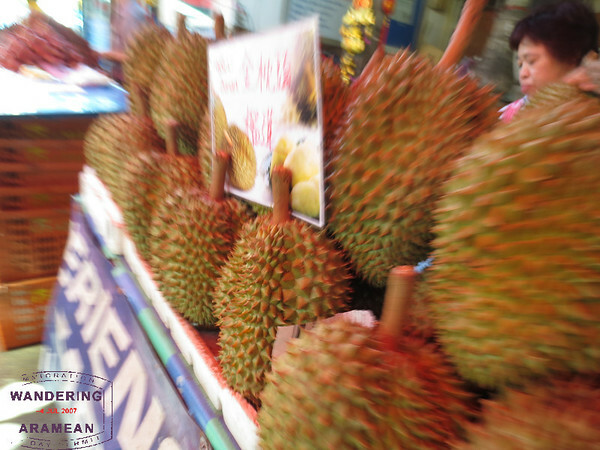 Durian is the best….it is just amazing how many people find it disgusting but I can’t get enough! 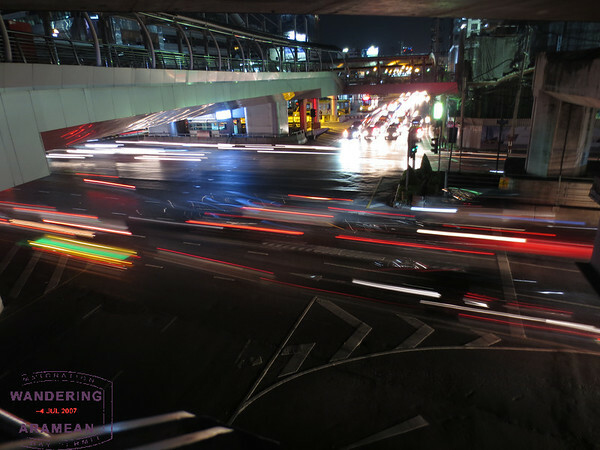 I have to ask – how’d you take that first picture of the traffic with the timelapse look? Also – awesome post. I’ve only spent 2 nights (which really translated into one full day to see the city), but heading back later this month and looking forward to it. The long exposure shot was take with my Canon PowerShot Elph 110HS. I forced it to ISO 100 and no flash and then held it steady against the railing of the overpass I was standing on. It is roughly a half second exposure but with some things moving and others not you get the feel of motion with the reasonably sharp focus on the other bits. I really like BKK and all of its insanity. But I like Thailand and the Thais in general quite a lot. I love that you can stay in such nice hotels for very reasonable prices. Compared to other big cities it is cheap. And its easy to get around cheaply. But I think the climate would kill me if I spent more than several days there at a time. I’d never go this time of year, but even “cool” season last year was very hot. Seth – Thanks! Gonna have to try that – heading out to Seoul, Bangkok then Bali, leaving Tuesday.